To Remember their Faces is an introductory activity geared towards teachers undertaking Holocaust studies with their students. Beginning with students at ages eleven or twelve, and continuing through high school, educators can find this a useful resource for introducing the Holocaust in less graphic terms. By seeing the human face we believe students will begin to understand that this happened to human beings and not numbers. As beguiling as many of the pictures are, one cannot ignore the fate of those in the photos, almost all of whom were murdered during the Holocaust; the majority in Auschwitz-Birkenau. The following is a suggested method for using the pictures. We often associate the Holocaust with pictures of carnage familiar to us from post-war pictures of Bergen Belsen and Buchenwald – stark, violent, black-and-white pictures taken upon liberation by horrified British and American soldiers. We picture anonymous mountains of corpses, their skeletal arms and legs akimbo, piled up beside mass graves. Confronted with these shocking visual images, we find it difficult to remember that these naked, neglected bodies were once human beings. Six million people were not born to be victims, but rather were born to have full lives and futures. They took joy from their children, they watched sunsets, they danced at weddings, they belonged to sports teams, they sunbathed on beaches, they were active in youth movements, they made art and music, they worked hard, and they had hopes and dreams for the future. All of this was brutally ripped away from them; Nazi ideology condemned them to death simply because they were Jewish. As the saying goes, “A picture is worth a thousand words.” In the Yad Vashem photographic archives there are hundreds of photographs of Jewish people taken during their everyday lives, before there was any plan to exterminate the Jewish nation. They are photos of people, now frozen in time, who stopped to capture a special moment for posterity – a beloved child, a happy family gathering, the hopeful faces of a newly-married couple. None of the people in these photos could have imagined the horrific fate that awaited them. None of them could have known that these snapshots would remain the last, and sole, testaments to the full lives they led; indeed, the only proof that these people once really existed at all. Tragically, not every face in these photographs has been identified. Those who knew and loved them, those who photographed them, were often murdered alongside of them. We have not been able to restore the names to all of them, as is their due. However, it is our hope that in presenting some of the faces behind the statistics of those murdered at Auschwitz, we will make these people more tangible. The presentation of the photographs here makes it clear that these were human beings. Before they were murdered by the Nazis, and before they were turned into dry statistics by the historians, they were people. They may have lived rich lives or unexciting lives or normal lives or unusual lives – but above all else, they lived - until they were cut down. Once you have looked into the eyes of the people in these photographs, they will not be anonymous any longer. If nothing else, the pictures included here make us stop for a moment and consider that these were people, just as we are, and that each individual was a universe unto himself. If we can understand that, we will have come one step closer to understanding what it is that we lost in the Holocaust. Zilina, Slovakia, Julia Neibaeur. Deported 1942. Her fate is unknown. Saloniki, Greece. Emanuel Aschkenazi, murdered in Auschwitz. Pilsen, Czechoslovakia. Otto Eliyahu Kumerman. Murdered in Majdanek. Pilsen, Czechoslovakia. Blanicka Herman. Murdered in Auschwitz. Uzhorod, Hungary. Tzvi and Rivka Apfeldorfer and brother and sister. All murdered in Auschwitz. Pilsen, Czechoslovakia, 1933. Jaruska Vesecka. Murdered in Auschwitz. Rosel Epstein. Murdered in Auschwitz. Ciechanow, Poland. Gushtzia Szpangelet. Murdered in Auschwitz. Unknown child. Murdered in Auschwitz. Batis family wedding. Ioannina, Greece, 1937. 19 of the people in the photo murdered in Auschwitz. Oradea, Romania. Zelma Galambos with her children, Peter and Paul. Zelma (middle) and Peter (left) were murdered in Auschwitz. Kevermes, Hungary. Yulichka Stern with her son Feri. Both murdered in Auschwitz, 1944. After examining the photographs, the class can discuss various points about them, to help deepen their understanding. Below are some questions, which may be used to help students discuss prewar Jewish life in Europe and the events of the Holocaust. When were these photographs taken? What do you see in the pictures that might tell you when they were taken? Some children may not know that the pictures were taken before the Holocaust… you can discuss with the class the meaning of this. Look at the various expressions of the people and poses in the photographs. What do they reveal about the people? Look at the children and babies in the photographs. How similar or different do they appear to be from children today? Some of the photographs chosen are of people who we cannot identify. In the Yad Vashem archives, there are hundreds of photographs similar to these where the names of the victims are not known. Entire family albums were found in various camps after the war, where nothing is known about the album owners or the people in them. Discuss with your students the meaning of photographs of unknown people. Why is it important to look at photographs of people before the Holocaust, before they became victims? What does it say about the victims? About the perpetrators? They can look up a Page of Testimony (if it exists) on the Yad Vashem website, on each of the people named. There they can discover more about the person beyond the photograph, and the name, if more information is known- who were their brothers, sisters, grandparents, wives, husbands, etc. 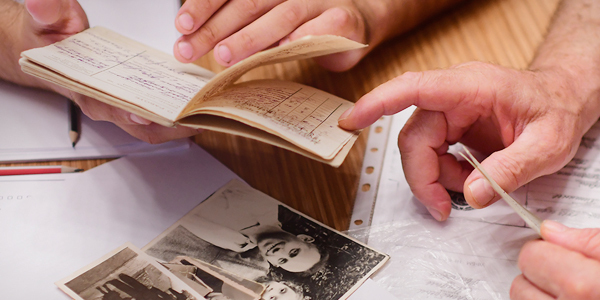 Using the extensive photo archive available on the Yad Vashem website, and using the keyword “prewar,” students can explore other photographs of Jews before the Holocaust. Youth groups, school photos, families having a picnic, etc. Each student can find a photo that is meaningful to him, and either write about the picture or present it to the class for discussion.